Hundreds came out to celebrate the harvest, wine, food and family for the First Annual Wine Fest in Humber Summit. Sept. 14th. Both Plunkett and Satterly Roads (near Islington and Steeles Ave.) were closed for kids, strollers, food vendors, and musical performances. 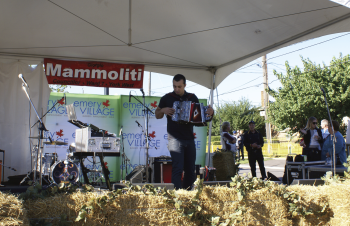 Everything from Rhythm and Blues to traditional Italian accordion music and rock filled the air that day. Among the smiling faces and music the busiest tent that day had to be the one reserved for wine tasting where free wine samples were given out. Many famous Canadian wineries were represented at the tent including Macedo Wineries, Majestic Wines, Vineland Estates, Colio, Bottega and others. 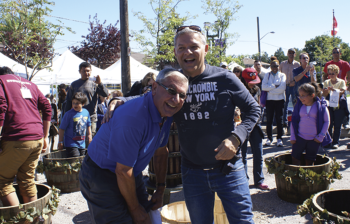 “The people living here were so pleased that they were recognized by the community and that the Emery Village BIA would choose to host it here…they were honestly humbled by it” according to Tony DaVersa, Chair of Humber Summit and one of the event organizers. 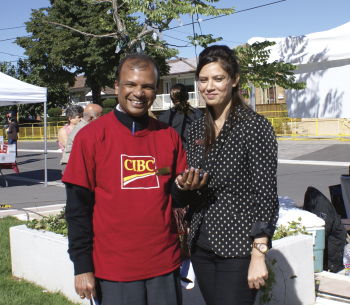 Pictures of the event, available online at emeryvillagewinefest.ca tell it all — lots of smiles and sunshine. Some of the best shots are of a Lucielle Ball look-a-like and children standing in oak barrels of grapes doing traditional wine stomping, their legs covered in purple juice. When it comes to hosting outside events – especially with a first annual event – weather was something that made the Wine Fest organizers nervous. “We were monitoring the weather reports each day leading up to it” says organizer Adriano Sanna. “We were keeping our fingers crossed. In the end, I couldn’t believe how lucky we were to get the weather we did”. In fact, Sept. 14th 2013 turned out to be a perfect sunny day bookended by days of rain – a meteorological miracle is how it seemed to the planners. 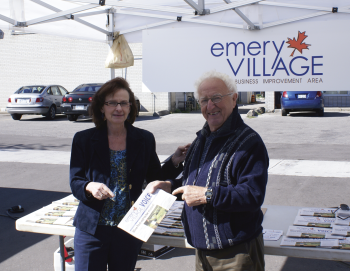 “You can do the best just possible putting an event like this together, and if it rains and it’s windy, even with rain tents, it won’t work that well, weather is everything” says Sandra Farina of the Emery Village BIA. It had been cooler in the first 2 weeks of September than it is normally, and predicting outside weather for anyone planning a simple BBQ these days is becoming increasingly difficult. Food was a big part of the event and many local restaurants participated — everything from African to Italian food. “Dominic’s Meats” was busy serving steak on a bun while Capri Bakery had traditional Italian fare. It seemed to be all there, right down to the hotdogs. Freshly squeezed grape juice courtesy of a traditional grape press with local seniors volunteering produced something to drink that you just can’t fine every day. “I loved the day”, gushed Sarah Fazio, a Wine representative with Bottega Wines. “It turned out to be amazing”. Sarah was one of 8 people who worked 8 hours non-stop in the wine tent serving wine samples: whites, reds, chardonnays, Italian, Portuguese, and Niagara region wines were represented. The Macedo wine reps, besides letting the wine flow in the tent, were especially busy in the days leading up to Wine Fest. Daisy Macedo and her sisters got a van and lugged barrels and grapes to TV and radio studios across the city to promote the event and had grape stomping demonstrations on Breakfast Television, the Global Morning Show, NewsTalk 1010 with John Tory, The Dean Blundell Show on Edge 102.1 and Sportsnet Radio the Fan 590. Suddenly, everyone was talking about a Toronto-based wine festival and saying “Emery Village” — which was the point too, say organizers. And when others talk up what you are doing, it certainly had an impact on skeptical locals who had never seen anything like this before in their own neighborhood. The media activity started to get them revved up too in the days prior. The purpose of the Wine Festival was not just to celebrate with an outdoor event, but to also officially launch the streetscape makeover of Plunkett and Satterly Road which saw the installation of new antique-style lamp posts, new Emery Village logoed steel benches, new parking inlays and new trees, new sidewalks, new historic markers and more greenery including flower beds. The entire makeover works well with the neat, well-kept 1960’s era bungalows that line the street. Michelle Krystal, a wine fest volunteer, who spent hours getting her “smart serve” certificate in order to help out serving the wine samples took notice. “I had no idea what to expect because I’m not a resident, but it was a perfect family day and the streets here just look beautiful” she said. “It’s so wonderful I could cry” said one Wine fest-goer who lives nearby but wouldn’t give her name. Luce at Il Lupo restaurant also seemed pleasantly surprised by it all. “It was good” said Luce beaming. “You want the truth?” asked, Tony D’AVERSA. “The residents here honestly didn’t believe that we were going to pull it off and make it happen, but we did”.